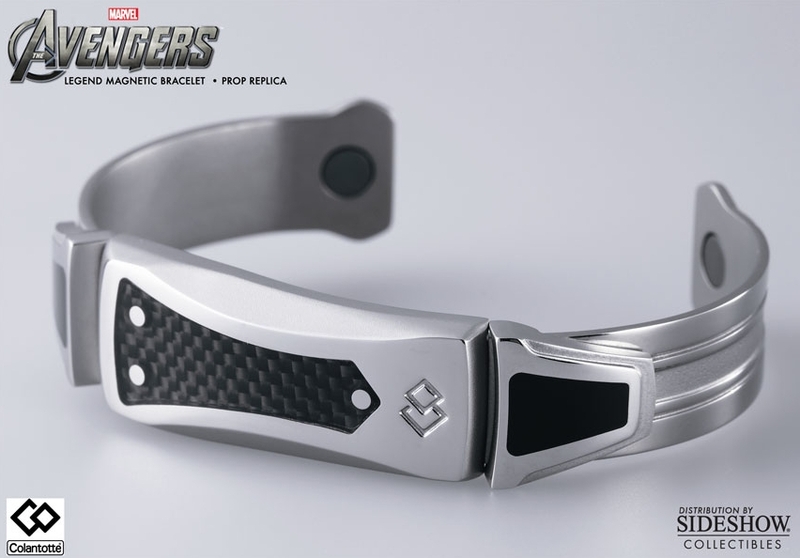 This is the Legend Magnetic bracelet as worn by Tony Stark (Iron Man) in Joss Whedon’s The Avengers movie! Manufactured by TRION Z (Colantotte), the bracelet is constructed of pure Titanium and Stainless Steel, complemented by a carbon fiber face. Colantotte magnetic accessories use high-grade permanent magnets in a trademarked Alternating North-South Polarity Orientation (ANSPO). This technology maximizes the magnetic field flow to span across the surface without creating a dead zone between the magnets. Available in small (5.1 – 6.3 inches), medium (6.3 – 7.5 inches), and large (7.5 – 8.5 inches). This is an awesome collectible for any fan of The Avengers!